Looking to sell gold? If you searched for "gold buyers near me" or "sell gold near me", look no further—you have come to the right destination. 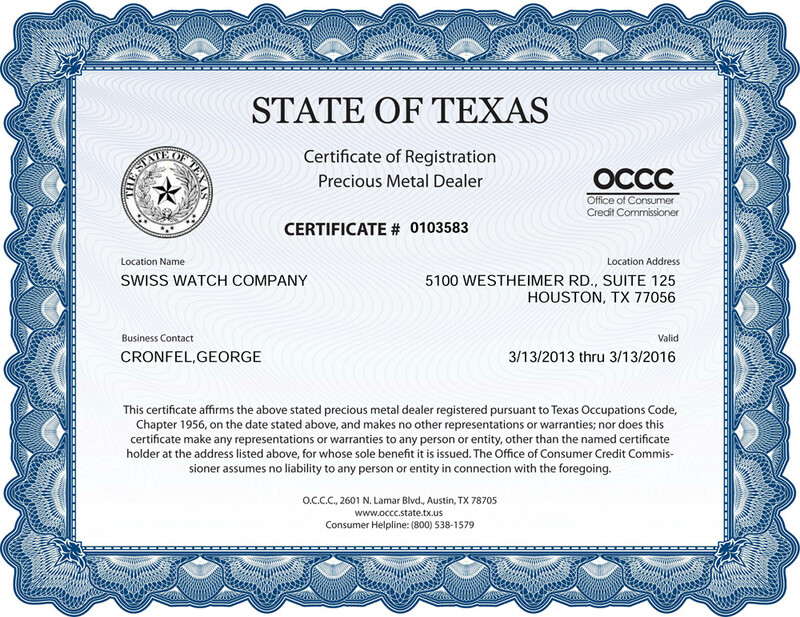 Swiss Watch Company is a Texas registered gold buyer in Houston. We pay the fairest market prices for all types of gold — broken, ugly, out of style gold jewelry and estate jewelry. We buy 10k, 14k, 18k, 21k, 24k yellow, rose, and white gold and items like cuff links, chains, earrings, bracelets, gold watches, cigarette cases, class rings. Basically everything but dental gold. Simply bring it all in; we separate it, then weigh it. We calculate the price based on the price of gold at that very moment. Next, we write you a check or pay cash. It’s that fast and easy! Hurry in to take advantage of the current high prices — We promise instant payment! Call us now at 713.877.8727 or visit us at our showroom located in the beautiful Galleria area in Houston, or send us an email here. Need to Buy Gold Jewelry? Wedding Rings, Earrings, Necklaces and Pearl Necklaces.